These sessions come in many different styles to suit your particular occasion, so please continue reading to find out more or simply get in touch with some details about your event and I will happily recommend which workshop will work best! 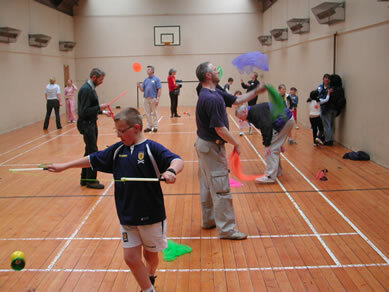 After some confidence-building activities, all the props are demonstrated by Steve, and then participants are organised in small groups to visit each Juggling Zone which contains a certain piece of juggling equipment (such as the diabolo). After a given period, the participants rotate round the room to practice at the next Zone an this process is continued until every zone has been covered. This method ensures that everyone gets a chance of using every prop and therefore a wider range of basic skills are learned. A free-time period where pupils get to practice with whatever props they liked best then takes place near the end of the workshop, and if the participants would like, we can put on a little show and tell / talent show at the very end of the session! This workshop can last as little as 20mins up to a full day or week’s worth of training! Ideal for festivals, fetes and informal occasions where people can’t commit to staying in the one place for too long as there is lots to see and do! Participants are able to join in and leave the workshop whenever they want. I will focus on making sure that new arrivals to the Juggling / Circus Skills area are made welcome and help them to learn a few skills, then wander around helping the other participants. It is normally found that the same people may actually drift in and out of the zone at various points during the event, with their confidence growing on each repeat visit! Sometimes I am hired by clients who charge an admission fee for my workshops, which can help offset my fee’s, so it can be a good way of providing an activity and recouping some expenditure to keep the Treasurers happy! Specific training based on a prop of your choice, such as learning to juggle. Just name your item and a lesson will be tailored to your requirements so that you can master the skill and know the best techniques and resources for continuing to learn long after this session has finished! If you are a leader in the Boys Brigade/Girls Brigade, Scouts (including Cubs, Beavers and Explorers), Rainbows/Brownies/Guides or Duke of Edinburgh Award Scheme, then I can help you work towards your appropriate Badge (it may be called Circus Skills, Performer, Skills, Creative, Entertainer or something similar depending on which organisation you are with!) I wrote 6 Activities for the BB Discovery Programme, and in 2013, I helped revamp the Scouts Circus Skills badge. You can therefore be assured that I am the right person to take you through your sessions! More details are available on my Circus Badges for Kid’s Organisations page. Available as an add-on to your Circus Skills Workshop. More details on the Giant Bubbles Workshop page. I teach juggling and performance skills to the participants and then work alongside them on preparing a show for the final day (day 5) which can be performed in front of an audience. Ideal for School’s and Sports camps looking for something “a bit different”. If the participants would prefer not to build towards a show, then the emphasis is changed to building up the skills the participants want to develop. We thought it would be a nice idea to have Steve perform at the party following my sister’s wedding, as it was an unusual idea and also a good way to entertain the numerous children that would be present. Not only was Steve’s performance highly entertaining and amusing, but he displayed a real talent in keeping the children’s attention and getting everyone involved. His natural friendly personality and easy-going and polite nature meant that his performance was perfect for a wedding party, and he really helped to break the ice amongst the guests. Following the party, many guests commented on how nice it had been to have him perform, and expressed an interst in hiring Steve for future functions and parties. Initially we had been unsure as to how a juggling performance could fit into a wedding party, but Steve not only met expectations but exceeded them, and I would have no hesitation in reccommending him to anyone considering hiring such an act! ~ 5·Star·Show·Stoppa (n.) – [1.] Of Superior Quality; First-Class. [2.] Thoroughly Skilled or Talented in a certain field or area; The Absolute Best. Wedding Party – 5 Star Show Stoppa! Steve was thoroughly entertaining and added a novelty moment to our forums Christmas party and to the surprise of one of our members who got roped in to spin all the plates. 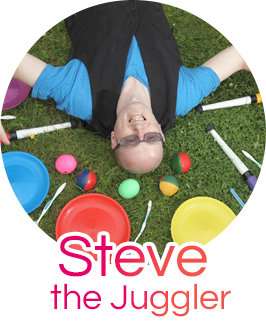 Steve was very good especially in such a confined space and would recommend him to anyone wanting a juggler. I really enjoyed the party and so did my friends too. We all had great fun. I especially liked learning the devil sticks. Going outside to practice the diabolos and everything else was great fun. The perfomance was great too. I’m really picking up on my juggling skills. Thank you for coming round. I am a Christian entertainer, and am quite happy to add a 5-10min Gospel Juggling show at no extra charge within the workshop if requested. Please visit the Christian Juggling page to find out more. This is ideal for Church groups and Outreach events. Parachute Games can be included during the Circus Skills Workshop as an added extra. If your participants have already taken part in a Circus Skills Workshop, then they may be interested in topping up their skills! Just let me know what skills the participants have, and I can make sure that they all learn further skills with their favourite props during this session! 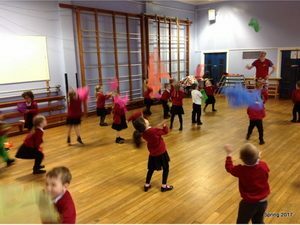 Duration: A workshop is best to run for at least 1hr but can last an entire School or Holiday Club day (eg 9am-3.30pm) with the same pupils gaining good skills with a variety of props. Capacity: Ideal sessions would have between 10-40 participants. To be fair on the participants, I would generally request that at least one or two other adults (such as teachers) are present during the whole session. They are more than welcome to simply participate in the sessions (and have lots of fun learning also), and just be available should they be required for any reason. If you have more than 40participants, then we could perhaps run several workshop sessions back to back (this could mean reducing a 2hr session to 2 x 1hr workshops, or adding an extra session). Cost: Please get in touch and I can send a quote or pricelist once I know your requirements. Circus Skills Workshops can work well alongside many other Juggling services such as Walkabout Entertainment, Training / Teambuilding events and my performances (including 30min show / Fire / Glow Juggling). Many more ideas can be found on the Juggler for Hire dropdown menu at the top of the page.